The author of Where The Road Begins, Peter Gray Scott, is a resident of the Oakland Hills, born and raised in Berkeley, and educated at Stanford. 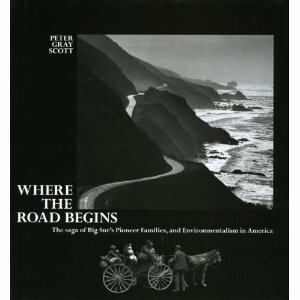 Mr. Scott is an architect who wrote this three-part book, Where the Road Begins: The Saga of Big Sur’s Pioneer Families, and Environmentalism in America. The Golden Age was an insular time when few outsiders passed through, and those who came and went, were provided food and shelter at a ranch, so long as they worked for their supper and bed. The highway creation itself was a State-managed project, with no environmental impact reports and no strategic planning. Promises were made to residents of culverts and bridges, and promises were broken. Rights of way weren’t paid to residents, yet the residents’ were paying the taxes that went to the road being dynamited through their land. And then came Ansel Adams. Ansel was one of the directors of the Sierra Club in the mid-sixties when he moved to Carmel Highlands. Ansel was never a resident of Big Sur, nor did he ever ask the opinion of any of the 800 Big Sur residents, but Ansel decided that the Sur needed saving and proposed the “Big Sur National Scenic Area.” A National Park like Cape Cod, except that Cape Cod National Seashore, with its 40 miles of wide sandy beaches, eleven nature trails, and three acre residential lots, isn’t like Big Sur. Imagine a one acre parking structure, built ten stories high, in Big Sur, and, if truly emulating Cape Cod National Seashore, then include picnic areas, comfort stations, shuttle buses and additional parking lots. Also, carve out a municipal airport. All these amenities were to accomodate an anticipated twelve million annual visitors*. How did the Sur escape such a fate? Buy Where The Road Begins: The Saga of Big Sur’s Pioneer Families, and Environmentalism in America. *Current estimate is about three million annual visitors. Looking forward to reading more about the history of Big Sur’s peoples–thanks for the heads-up, and for that of the petition to end the OHV div of State Parks! Signed and forwarded up and down the coast.